You may be shocked to know that HTML5 doesn’t allow italics or bold. Old-style HTML had the <i> tag for italics and the <b> tag for bold. These seem easy to use and understand. Unfortunately, they can trap you. In your HTML5, you shouldn’t specify how something should be styled. You should specify instead the purpose of the styling. The <i> and <b> tags in XHTML Strict are removed in HTML5 and replaced with <em> and <strong>. The tag means emphasized. By default, italicizes your text. The tag stands for strong emphasis. It defaults to bold. This paragraph illustrates two main kinds of emphasis. 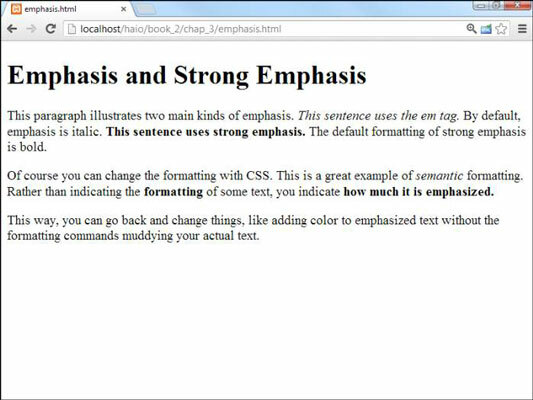 By default, emphasis is italic. The default formatting of strong emphasis is bold. Of course you can change the formatting with CSS. This is a great example of <em>semantic</em> formatting. It’d be improper to think that is just another way to say italic and is another way to say bold. In the old scheme, after you define something as italic, you’re pretty much stuck with that. The HTML way describes the meaning, and you can define it how you want.